As a family we don’t really prioritise holidays and actually we this was our first trip abroad with Sonny. I felt completely out of my comfort zone in terms of what the boys might or might not need to take away with them. Luggage allowance is always tight and I was undecided whether we need to pack half a suitcase full of lego or just rely solely on the heaven sent iPad. Just before we went away I was sent two Jetkids Bedboxes to try. They are basically a cross between a ride on suitcase (which I’m sure you are familiar with) and a bed. 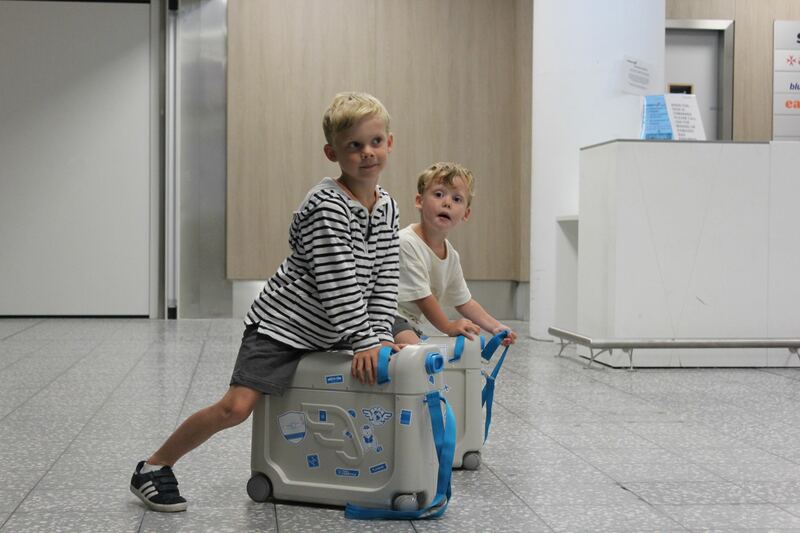 They are the perfect dimensions for carry on luggage and I decided that the boys can have as much entertainment as these two suitcases would hold. They are quite roomy and allowed for a few mini games and lots of colouring books, not to mention the iPad. 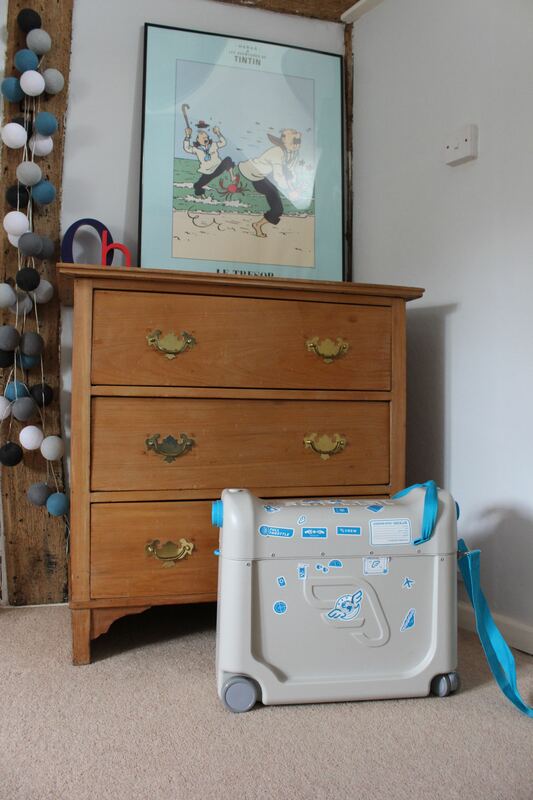 I hadn’t opened the Jetkids bed boxes until the night before we were about to fly and I don’t think I appreciated how much better they were than the Trunki’s the boys have had in the past. Firstly the wheels at the front spin 360 degrees, making cornering (aka racing) amazing and so much easier to navigate busy airports. They come with retro suitcase stickers for the boys to personalise them. Which was fab because it meant they also knew who’s case was whose. The really amazing thing is what I briefly mentioned earlier, they turn the airplane seat into a bed. Our flight was only 4 hours but even so Sonny had a little sleep during that time and the mattress made it so much more comfortable for him. Unfortunately he was leaning his head on me so I couldn’t grab a picture! However here is one from the website so you have an idea of what it looks like as a bed. 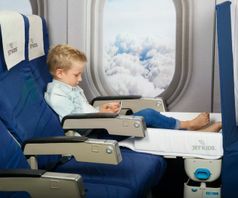 Although they are designed for flights we will definitely be using ours for things like staying over at the grandparents houses too. 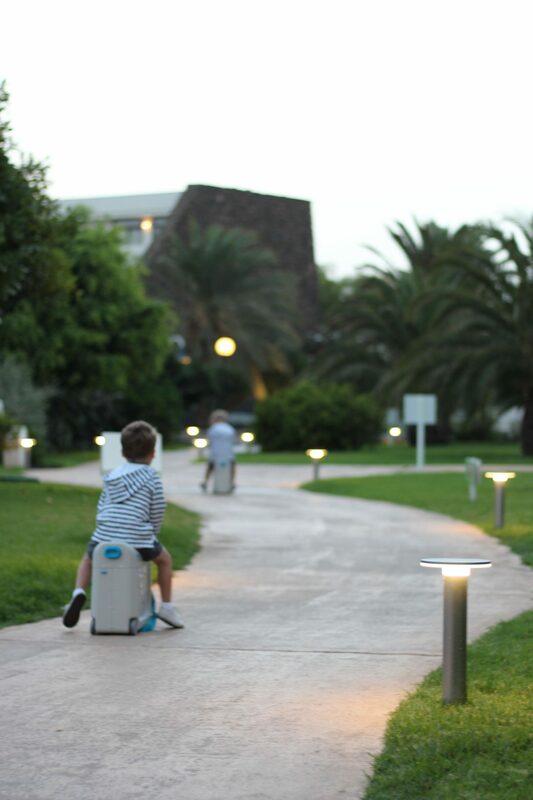 The boys were so entertained scooting around the hotel grounds on these that actually we didn’t need to pack anywhere near as many ‘keep them busy’ toys as we did. At least I’ll know for next time! 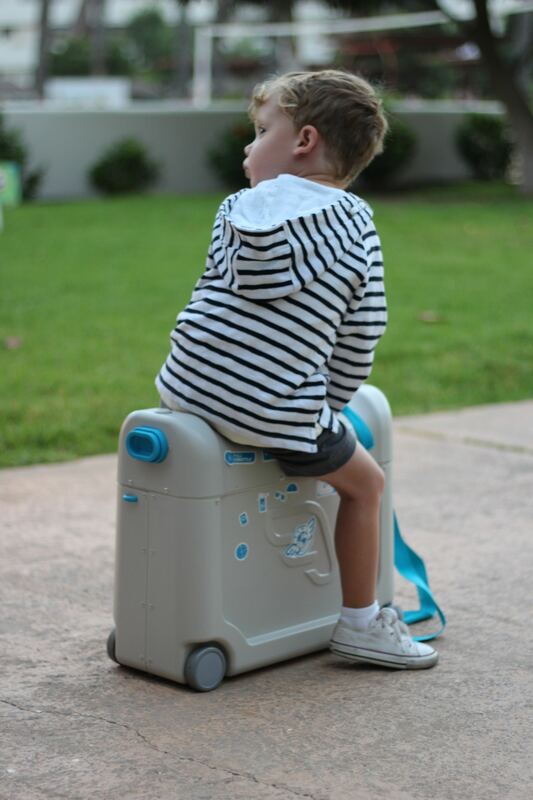 * Jetkids kindly gifted me these ride on suitcases to try, however all words and opinions are my own.